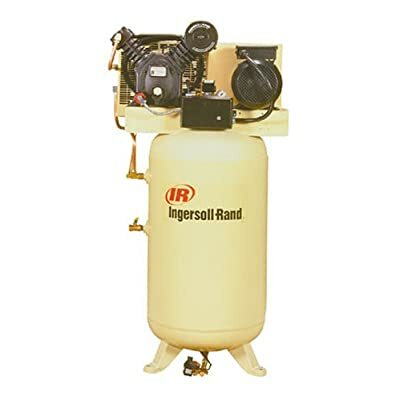 When it comes to shopping for air compressor, the rule of thumb is buying the one with the largest air tank that you can afford. Having a generous air tank of 80-gallon for instance, means you won’t have to worry too much about running out of pre-compressed air to use right in the middle of your project. However, investing in an air compressor with huge tank capacity can be pretty pricey. You obviously don’t want to spend your hard-earned money on an overpriced air compressor that fails to live up to its insane price tag. You may feel yourself drowning in options because there are so many different companies manufacturing air compressor out there. To make the right purchase, we’re afraid you will have to spend a lot of time and effort visiting the stores, doing research and reading online reviews. With the hope of making your life a little bit easier, we managed to put together a short list of “The Best 80-Gallon Air Compressors For Your Money”. These recommendations were hand-picked by us based on our own experience, research and customer reviews taken from online shopping sites. We hope you will find this list helpful and soon find a perfect air compressor that meets all of your requirements. Usually dubbed as one of the strongest 80-gallon single-stage air compressors in the market, the DeWalt DXCMLA4708065 Stationary model stands out for its power. Featuring 240 Volt motor running at 4.7 horse power to ensure maximum performance, safety and efficiency; this air compressor provides you with high level of power enough to support multiple heavy duty tools at the same time. Longer run time is also achieved thanks to its huge air tank capacity. This air compressor is able to deliver up to 16.1 CFM at 40 psi and 14 CFM at 90 psi, allowing it to handle all of the pneumatic tools you have at your workshops. 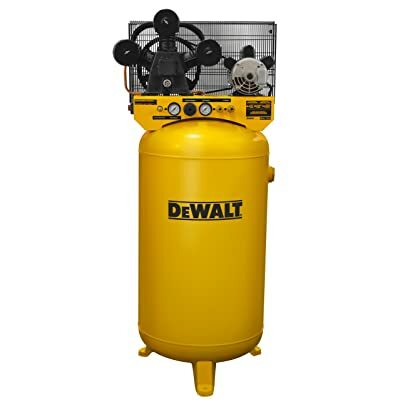 The DeWalt DXCMLA4708065 Stationary air compressor features 3 cylinders and a Hi-Flo pump. Made out of cast iron, the oil-lubricated pump is highly praised by customers and considered one of the strong points of this machine. Some other notable features are the stainless steel flex leaf valves made in Sweden, a durable one-piece cast iron crankcase body and a sigh glass that makes it a lot easier for you to see the oil level inside. Last but not least, the integrated control panel comes with an airflow regulator and many convenient features such as two quick-connect air outlets and a tool pressure gauge. If you find yourself using many heavy duty tools for a long time, you should consider this air compressor because of how strong, steady and convenient it is. However, keep in mind that a strong machine usually comes with some extra weight. This air compressor can be a little bit too heavy and bulky for some customers. It can take up a lot of space in your home workshops so think carefully before purchasing. The Powermate Vx PLA4708065 electric air compressor features a powerful 240 Volt 15amp motor that delivers up to 4.7 horse power. This air compressor is able to provide 14 CFM at 90 psi, which means it can power all of the heavy duty air tools you need to use for your craft projects. If you happen to be a multi-tasker, you will love this air compressor thanks to its ability to handle many different air tools at the same time. The huge air tank capacity ensures long run times and steady air flow, allowing you to finish your task without any interruption. This air compressor has a very strong and solid built; featuring a cast-iron crankcase body, 12-inch cast-iron flywheels and Swedish stainless steel valves. The oil-lubricated pump is designed for extended use so you don’t have to worry about refilling the oil regularly. The noise level is measured at 83dB, a lot quieter than what people expect from such a heavy and powerful air compressor. The operation noise is a bit louder than a loud conversation but not loud enough to upset your neighbors. The Powemate Vx PLA4708065 electric air compressor is an appealing option for those who need to use many different air tools for a long period of time. However, you will need to purchase a power cord and a pressure regulator separately because they do not come with the machine. You also need to bold this air compressor to the ground to ensure safe operation. In general, this air compressor is suitable for home-use but it can also be used in small-scale workshops and manufacturing areas. The DeWalt DXCMV5048055 two-stage air compressor is famous for its excellent performance and durable construction. With its powerful 5.2 horse power motor and maximum working pressure at 175 psi, this air compressor has the capacity to handle heavy duty air tools like no other. It also delivers 17.9 CFM at 100 psi, plenty of air for you to run multiple tools at the same time. Thanks to its huge air tank capacity and robust 240 Volt induction motor, this air compressor is also one of the best at providing continuous use and steady air flow. It has a very sturdy and durable iron-cast crankcase body. Other notable features are an aluminum head, automotive style bearings, an aluminum valve plate and a 12-iron flywheel; proving that this machine was designed to be one of the most stable and longest-lasting in the market. The integrated control panel also receives praise for how reliable and convenient it is. This air compressor also comes with a handy Thermal overload protection system in case of voltage fluctuations. The DeWalt DXCMV5048055 is consistently rated as one of the best air compressors in the market today because of its top-performing motor and extraordinary longevity. This air compressor is a great option for industry manufacturing areas and large-scale workshops. For the home users, this machine can be too heavy and bulky as well as too powerful for them to use it to its full capacity. For an 80-gallon air compressor, the Ingersoll Rand C2475N7.5FP definitely has one of the strongest motors in the market. Thanks to its ultra-powerful 7.5 horse power motor; this air compressor can provide consistently high air pressure, allowing it to support almost any industrial air tools with ease. Thanks to its smart design, this air compressor does not take up a lot of space despite having high-performing power. It has an especially strong cast-iron crankcase body that can survive even the harshest environment. It also comes with many convenient features such as an air-cooled after coolers to enhance performance, an electronic drain valve for automatic water removal and a low oil protection switch. This machine is also widely praised for being highly reliable, delivering consistent heavy duty power throughout its lifetime. Because of its superior power and sturdy construction, this air compressor is perfect for industrial use. If you want to use this machine at home, keep in mind that it is actually very heavy so it may be quite difficult to move it around. Moreover, it may not be necessary for the home users to invest in such a strong air compressor like this one. 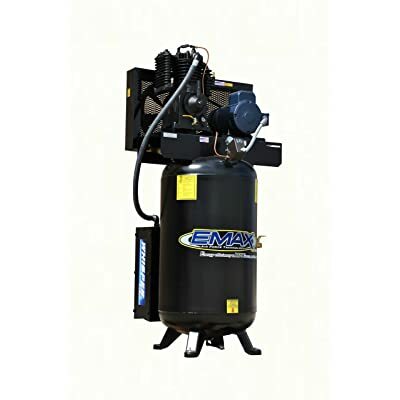 There is no denying that the Emax ES05V080I1 is a powerful air compressor. It is designed to last for at least 50,000 working hours with proper maintenance. This machine features a distinctively low RPM pump and delivers 19 CFM at 100 PSI. With such extensive power, this air compressor is widely used in factories, manufacturing areas and large-scale workshops. It has a durable solid cast iron crankcase body built to withstand the harshest working environment. Other notable features are rebuildable rods, removable cast iron cylinders, built-in head unloaders, built-in inter-cooler and after-cooler… All of the features were designed meticulously to deliver the highest efficiency and convenience for users. However, what really makes this air compressor special is the Emax’s exclusive air silence system called “The Whisper”. This system can reduce the noise rating of stationary air compressors by 25%! “The Whisper” can be installed and run in any kind of working environment (garage, farm, industrial workplace, factory…). “The Whisper” dissipates compressor intake noise by channeling the intake air through a series of baffle plates and pre-filter media within the silencer cabinet. As a result, the piston intake noise is trapped and dissipated within the silencer structure. It also acts as a secondary filtration for cleaner air. “The Whisper” system is located on the back of the tank and to be removed easily for maintenance. This air compressor is definitely a top choice for industrial use. For home-use, this machine is too heavy and too powerful. A DIYer will hardly use it to its full potential. Thanks to Emax’s air silence system, engineers and industry professionals will have one less thing to worry about when dealing with occupational noise. Last but not least, there is another version of this Emax air compressor with 7.5 horse power for those who demand even more power and longer run time. Before worrying about the price and what model you should buy, you must ask yourself first whether you need a single-stage or a two-stage air compressor. The only way to do that is to understand the difference between them in terms of structure and usage. The number of stages represents the number of times the air gets compressed between the inlet valve and the tool nozzle. Therefore, “single-stage” means the air is compressed once while “two-stage” means the air is compressed twice to double the pressure. For a single-stage air compressor; the air is sucked into a cylinder and then compressed once at roughly 120 psi before being moved to the storage tank. For the two-stage air compressor, the air goes through the exact compression process as in the single-stage one. However; instead of being sent to the tank, the air will be moved to another piston for the second compression at about 175 psi. After that, the air is finally stored in the tank for later use. The single-stage air compressor is best used at home or small-scale craft shops. It can power a great variety of handheld tools, making your weekend DIYs project a lot easier. Meanwhile, the two-stage compressor is usually used in factories or large-scale workshops where the machines demand higher level of air power and longer continuous air supply. DeWalt is an iconic brand that manufactures many top-rated air compressors in the market. Their machines are best known for extreme durability and incredible power. 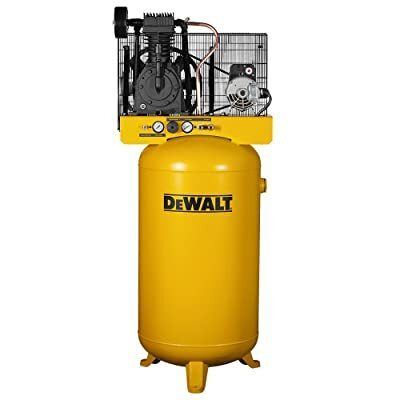 DeWalt offers a great variety of air compressors that can be used for industrial work, household DIYs or both. Their air compressors are all famous for having overwhelming power that serves customers well with very little need for maintenance during their lifespan. If you are interested in powerful air compressor but not keen on regular maintenance, DeWalt is definitely the brand for you. Compared to other air compressor brands, Powermate is renowned for their high quality components. They have made a name for themselves with their series of excellent stationary and portable air compressors. Powermate provides so many options for you to choose from, from the light-duty to the heavy-duty kind. 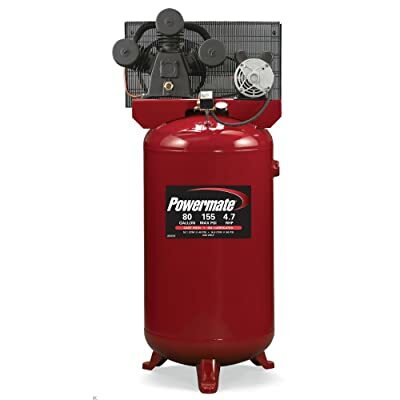 When it comes to home-use air compressor, Powermate has always been one of the top brands. Their machines are highly durable with great & consistent air power and numerous convenient features. Those are exactly what all of the DIYers in the world are looking for. Emax earned a place in the market with their remarkable “Whisper” air silent system. This unique feature significantly reduces the operation noise of their air compressors. Other than that, Emax is also famous for their compressor pump with high durability and low RPM. As a result, there is no surprise that Emax has become the number one air compressor brand for those who wish to keep their ears healthy and safe. Ingersoll Rand is a familiar brand to those working in the construction industry. For so many years, the company has manufactured high-quality power tools for both industry professionals and home users. Their flagship product is air compressor, which is famous for having immense power and delivering continuously reliable performance. Those are our suggestions for “The best 80-gallon air compressors” in the market at the moment. They are not only our picks but also everyone’s favorites considering the fact that they were featured everywhere when people ask about the best air compressors. Please remember that everyone has different expectations when it comes to air compressors. You may want to buy it for your DIY projects at home, others may buy it to use at their factories or workshops. The most important thing is to know what you use it for and what you look for in an air compressor. Read our reviews, do a bit research on your own and go to the stores to see the machine for yourself before making any decision. We wish you the best of luck on your quest to find the right air compressor!